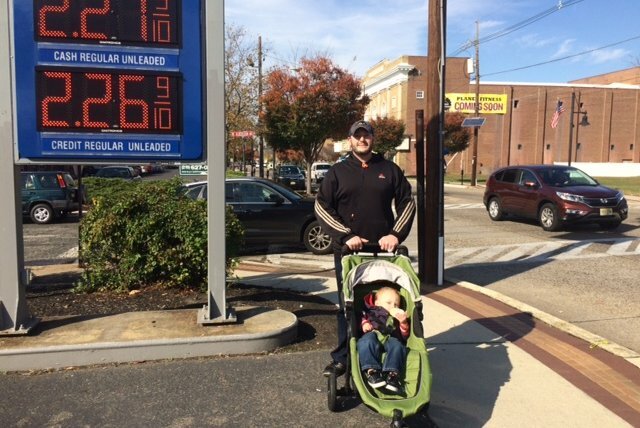 "I hate it," said Chris Ruper of the overnight gas tax hike of 23 cents in New Jersey. His wife does home care and drives from client to client. He said she'll be eating the the extra costs to gas up. Making up for 26 years of no increases, New Jersey hiked its fuel tax by 23 cents a gallon overnight. Once one of the lowest gas tax states in the country, New Jersey now has the seventh highest. Many stations were under $2 a gallon before the midnight jump. On Tuesday, prices ranged from about $2.20.9 to $2.38.9. The overnight jump is on top of the state's existing 14.5-cent levy, making the total per-gallon tax 37.5 cents a gallon. After weeks of wrangling and a shutdown of state transportation projects, Gov. Chris Christie, whose approval rating last month sunk to just 21 percent, signed the measure. The gas tax, as well as Bridgegate, was cited by respondents. The tax was pushed through the legislature, which is controlled by Democrats. The hike coincides with a mass transit strike by SEPTA workers in Philadelphia, which meant many Jersey commuters who work in or around Philly drove to work on Tuesday. Republicans have made motions to repeal the unpopular tax hike, but the prospects for a repeal are not good. "I hate it!" Chris Ruper said Tuesday morning as he walked past a gas station on Haddon Avenue in Haddon Township. "Hiking it 23 cents all at once is a lot," he said as he pushed his son, Landon, in a stroller past a gas station where no one was buying. "My wife does home care. She drives from person-to-person. She dives a lot, fills up at least once a week. This will hit her hard," he said. He guesses it will cost about $5 more a week to fill her tank or more than $250 annually. His own work commute is just two miles, so even though he drives a pick-up truck, jacking up the price of gas won't have much impact on the price of his own driving just yet. But when Landon hits the age of two in about six months, Ruper knows he'll be driving more, ferrying his son to and from activities. Charles Oelhert, a college student with a passion for Jeeps, said the hike will take a toll on him. He was stopped at a Wawa in Cherry Hill with gas pumps. He'd filled up just two days before – he knew the hike was coming and wanted to be ready. But he was already down about half a tank already. Oelhert said he knows Jersey roads need work – the Jeep telegraphs every pothole – but then he's not sure why roads and bridges seem to have more political support >>than say education the teachers. "The politicians are picking and choosing," he said. He added the hike will likely mean other prices will increase; Uber has already boosted fares in New Jersey. He also pointed out that gas prices tend to increase in the spring, so there will be that to deal with, too, in a few months. "It has a domino effect," said Oelhert. Down the road in Haddonfield, Annabelle Cedar was oblivious to the overnight boost in price for gas at a Sunoco station. "I'm terrible," she said with a shrug, admitting she never looks at the price per gallon, nor does she look at the overall charges for a fill-up on a credit card. Cedar works from home, so the 20,000 miles she logs each year on her SUV is all about hauling her family around South Jersey. "It won't change my driving," she said.